Everyone wants to learn something at some point in their lives. They may settle for a job to make both ends meet, but there’s always that one craft they want to learn so bad. Workshops are offered to those who want to learn. It can be about filmmaking, creative writing, music and a whole lot more. It is held mostly in schools and conference venues. Its audiences mainly include students and young professionals. Everyone is welcome to sign up and join one. However, it is a different story when you are the organizer. You have to take care of everything since this is an event. Workshops can be a one-time event or on a weekly basis within the span of a month. It just depends on the simple budget. The first thing you have to do when you want to conduct a workshop is written a proposal. This is usually the beginning of everything. Pitch every idea you have for the workshop in the proposal. In writing one, simply follow these steps. 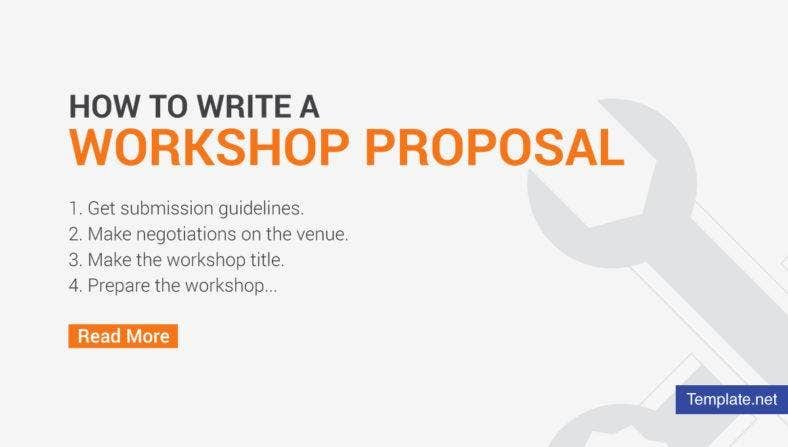 The first thing that you have to do before writing a workshop proposal is looking for an institution or program that could back up the workshop. Get their submission guidelines and match it with your workshop details. It’s good to do a little research if you are not familiar with the program. 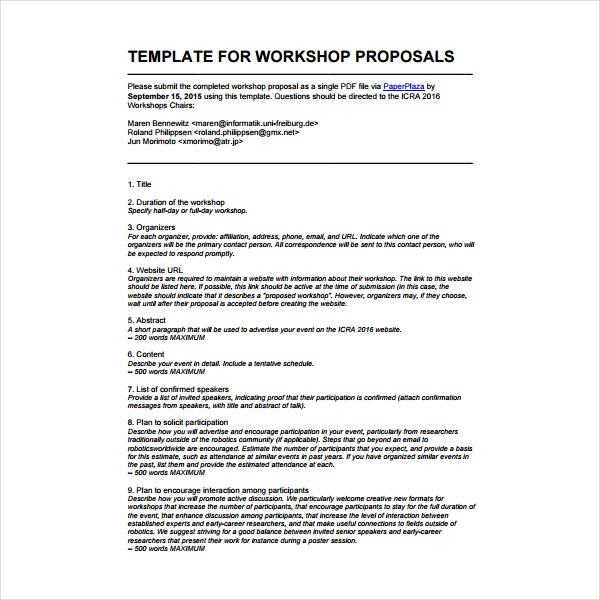 You may also like sample training proposal templates. 2. Make negotiations on the venue. Look for a venue where the workshop can be held. Reach out to the contact persons and ask about the hourly rent of the venue so you can allot money for it. Make the necessary arrangements on how much you’re going to pay the rent. Give them a particular date on when you are using the venue so they can reserve it for you. You may also see training business proposals. 3. Make the workshop title. The next thing you do is make a workshop title. This one should be catchy, specific and interesting. Contain what your workshop is about in a few words. The catchier, the better. This will spark interest in people to attend your workshop. Chances are people will ignore your workshop if it has a poor and flimsy title. You may also like proposal samples. 4. Prepare the workshop summary, syllabus, and objective. Explain what your workshop is all about. This will give the readers an idea of what you’re going to teach. Make an outline on the course syllabus so there will be a clear flow once the workshop takes place. If the workshop is good for one day, prepare an hourly syllabus. If it is good for a few weeks, prepare a weekly syllabus. You may also see training business proposal. The objectives should be specific, as this determines what the students will learn at the end of the workshop. Do not settle for vague objectives. For example, a good objective would be for the students to apply the basic rules of filmmaking at the end of the filmmaking workshop. As the workshop goes on, aim at hitting all the objectives you have in mind. You may also like event proposal templates. The last on the list of your proposal should be the resume. Update it with the recent job experiences and previous workshops that you conducted. This will add more credibility to you as a speaker and trainer. Attendees, especially students, trust someone who has more experience than just knowledge in a certain field. You may also like training proposals. The workshop proposal is not only limited to the title, summary, resume and objectives. Now that you have it, many things are missing. So many things have to be included in the proposal to make it convincing and favorable to the readers. Here are some of the other things to be included in the sample proposal. Of course, these are one of the most basic and important things in any proposal include your name, contact number, email and social media pages if possible so the investors can contact you anytime. This is also useful for students who want to keep in touch with you after the proposal. Make a list of supplies you need for the workshop. State how many chairs, tables, markers, boards and other supplies that you might use for the workshop. If possible, put a little excess on the numbers. You might not anticipate the number of audiences for your workshop if it goes beyond the maximum number you have already set. You may also like sample proposal outlines. 3. Audio and video needs. State what kind of audio and video materials you need during the workshop. Tell them the number of projectors, microphones, and speakers that you will use. As with the supplies, you can request for a spare unit if ever one unit does not function well. You may also like writing proposal templates. Determine the amount of course fee that the attendees have to pay for your workshop. This should be honest and fair since you will use the money for other expenses related to the workshop. You may also like simple project proposals. Determine the number of students that you can accommodate for the workshop. You can start with the first 20 to fill in the registration or go with as much as 50. Think about the venue and the kind of workshop that you want to conduct before stating the number of attendees that will participate. You may also like proposal letters. State in the proposal the ways on how to market your workshop and be able to get it to a larger audience. Your workshop needs to be advertised to spark interest to the public. 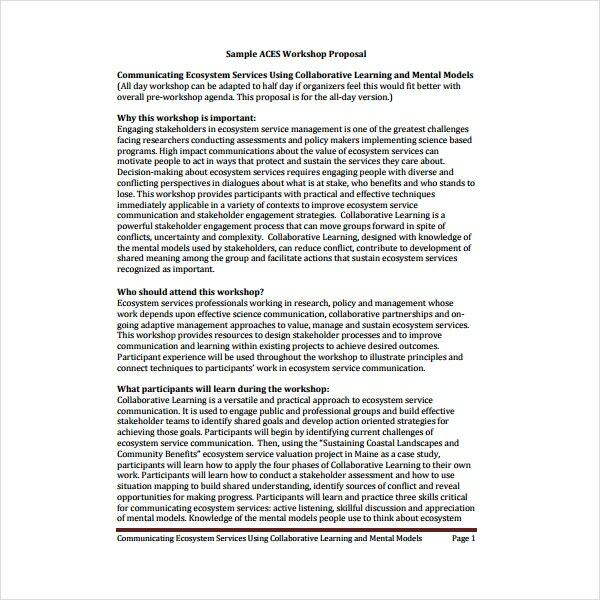 List down the requirements or qualifications for the attendees of your workshop. That includes age, hobbies and preferences, a location of residence and educational level. This will narrow down the audiences of your workshop but it’s helpful in maintaining a single type of audience. You may also like service proposal templates. As the speaker in the workshop, come up with a lively one. Engage and immerse your audience in the knowledge that you are giving. Give them the drive to learn more about the topic. Any new knowledge becomes more interesting when given properly. You may also see budget proposal templates.